When Tesco Bank told us they wanted to bring a human touch to their courseware for this year we pondered for a while.....what makes something feel human? Then it struck us – FAMILY! 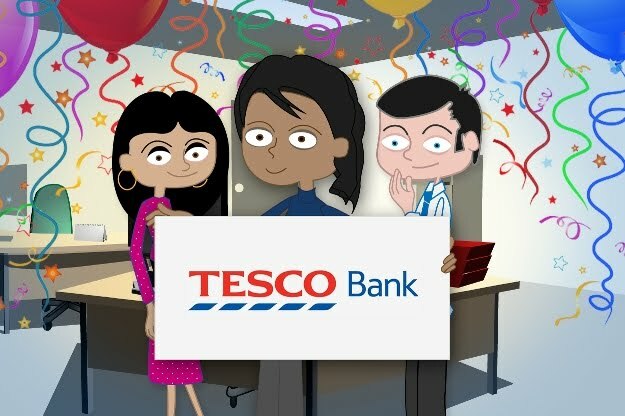 And here was born the concept of the Tesco Family that has brought a very human, fun and effective touch to Tesco Bank eLearning and their Academy Online this year. Families can be your classic mum, dad and kids, while many people nowadays actually spend more time with their ‘chosen’ families, ie their mates and close colleagues. The most important thing for us when developing the Tesco Family concept was ensuring that the characters we introduced to Tesco Bank’s online learning resources captured the sense of personal familiarity and friendliness that reflected Tesco’s values and principles. A set of illustrative ‘cartoon’ characters and scenarios (call centre, supermarket and office) were developed comprising traditional family unit members and workmates, who act as guides through the learning, and pop up with useful tips and hints. The concept relies on humour and personalisation to engage the user, provoking instant likability, but without compromising the serious undertones of the course. To date seven courses have been developed using this concept - Approved persons, Complaints, Equality and Diversity, Fraud, Information Security, Role of the FSA and SYSC. Paul Murray, Learning Services Consultant at Tesco Bank, admits the novelty of the concepts had staff intrigued about the learning from the outset. He said: “There’s no better way to get people into something than to get them talking about it and people were definitely talking about this. Everyone can relate to the characters in the Tesco Family, whether it’s the comfortable familiarity of going round the supermarket with your wife and kids, or enjoying easy camaraderie with your close workmates. The Tesco Family was created by Unicorn’s ‘Two Richs’ graphic design dream team of Richard Armitage and Richard Kelly. Rich Armitage said: “It’s brilliant when you get clients that are so open to what may at first seem like slightly-off-the-wall ideas. It makes our job much more fun, interesting and challenging. Tesco Bank were great to work with on this concept."